• TRUEVIEW™ HIGH OUTPUT LIGHTING solutions combine the most advanced LED technology, versatile product designs and REDLITHIUM-ION™ batteries to provide our core tradesmen greater productivity as they take on their day. • Every TRUEVIEW™ light ADAPTS, PERFORMS and SURVIVES unlike any other light used by professionals today. • 3 light settings - twelve high performance LEDs provide 2000 Lumens on High light output which is brighter than 250 Watt halogen, 1300 Lumens on Medium light output and 850 Lumens on Low light output. • Impact resistant adjustable head with highly durable polycarbonate lens can be rotated 230° vertically and pivoted 240° horizontally. • Protective guard secures the head and lens when the light is collapsed for storage or transport. • Extendable mast which reaches from 1.10 m to over 2.20 m to light up work spaces from top without casting shadows. • 10 hours of runtime on Low light output, 6 hours on Medium light output and 4 hours of run time on High light output with an M18™ REDLITHIUM-ION™ 5.0 Ah battery pack. • IP54 - protected from dust and splashing water. 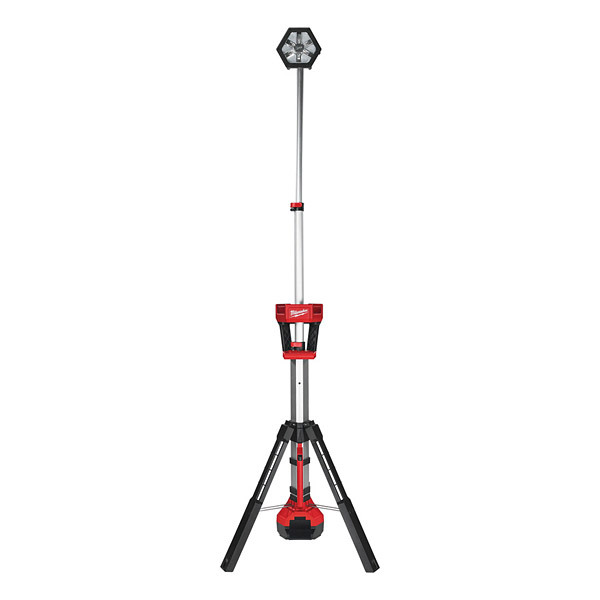 • Compact footprint with low centre of gravity and impact resistant reinforced nylon legs to protect against abusive jobsite conditions. • Carry handles on two positions for easy one handed transport: weight is evenly balanced when compressed. • Low battery indicator - light flashes when battery pack is low.